Catalina Yachts is in many ways an anomaly—a mass-production boatbuilder that eschews design fads in a manner more typically associated with companies that produce far fewer boats at much higher prices. The result is a product line that is robust, reliable and easy on sailors. Catalina Yachts is in many ways an anomaly—a mass-production boatbuilder that eschews design fads in a manner more typically associated with companies that produce far fewer boats at much higher prices. The result is a product line that is robust, reliable and easy on sailors, whether they&apos;re racing around the cans or out cruising. Catalinas may not be overly flashy, but they continue to evolve, as is evident in the new Catalina 315, the latest in the “5” series that includes the 445, 355 and 385 as well. The Catalina 315’s hull is solid hand-laid fiberglass with an external vinylester layer to resist blistering. Like the other boats comprising the 5 series, the 315 is built in a four-part mold that creates a seamless monocoque structure from stem to stern to enhance rigidity and ensure there are no leaks, especially in the transom area. The deck is cored with end-grain balsa, with solid fiberglass in high-load areas to increase longevity. The keel is lead, and a grid system bonded to the hull beneath the cabin sole distributes the keel and rig loads. Forward, there is a watertight “StrikeZone” in the bow that is filled with foam in case of collisions with containers and other debris. The boat’s proprietary “T-Beam MastStep” arrangement employs a compression post that passes through the deck to ensure that it is, indeed, the post that supports the rig, and not the surrounding fiberglass deck. The rudder stock is 316 stainless steel, while the rudder itself has a molded-in leading edge, which eliminates a vulnerable seam on the foil&apos;s vertical centerline. All in all, this is a solid, well-constructed boat—exactly what you would expect from Catalina. The hardware topsides is first-rate throughout, from the sturdy portlights to the beefy anchor roller forward to the blocks used to control the running rigging to the nice 27in-high stanchions and solid stanchion bases. There’s no mistaking the 315 for the latest trendy creation from the other side of the Atlantic—which I suspect is just fine with sailors who are attracted to this kind of boat. 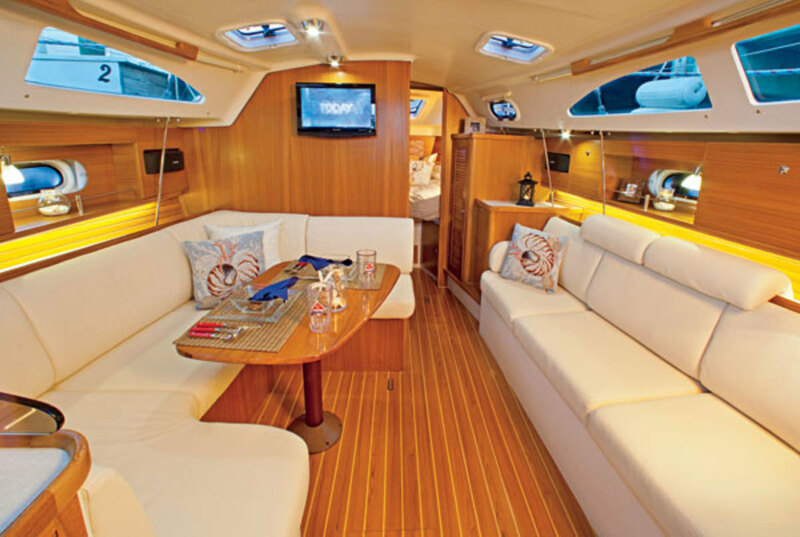 Side decks are easy to negotiate, the foredeck provides a good open workspace for dealing with ground tackle and headsails, sturdy stainless steel handrails run the length of the cabintrunk, and the cockpit seats are long, well-proportioned and comfortable. Sightlines are excellent from the helm, and the pushpit seats provide a nice out-of the way spot to take in the view. Belowdecks, Catalina has in many ways become its own worst enemy. The company does such a good job it’s easy to take what you’re looking at for granted. Joinery is all superbly finished teak, mostly veneered but with solid inserts in high abrasion areas, so that owners can sand out dings and scratches without exposing underlying laminate. Forward, there’s a V-berth and head/shower arrangement, while a good-sized transverse double can be found aft. It really is incredible how much “boat” Catalina is able to create belowdecks, although the V-berth is a bit tight in the toes for a six-footer like me. The U-shaped galley with centerline sink is more than adequate for a 31-footer, especially given the wealth of cold-storage space. Catalina&apos;s chief designer, Gerry Douglas, who was with us for our sail trial has wisely resisted the siren call of maxing out the accommodations and created a huge locker space aft and to port, instead of trying to squeeze in a second aftercabin. Some nice touches include excellent engine access, with a special cutout so you can check fluids without having to lift up the entire companionway. It may be a little thing, but those kinds of details are typically a sure sign that the builder not only knows what he’s doing, but truly cares. Overall finish quality, from the cedar-lined hanging lockers to the sliding privacy screens to the louvered doors is outstanding, especially for a mass-production boatbuilder. 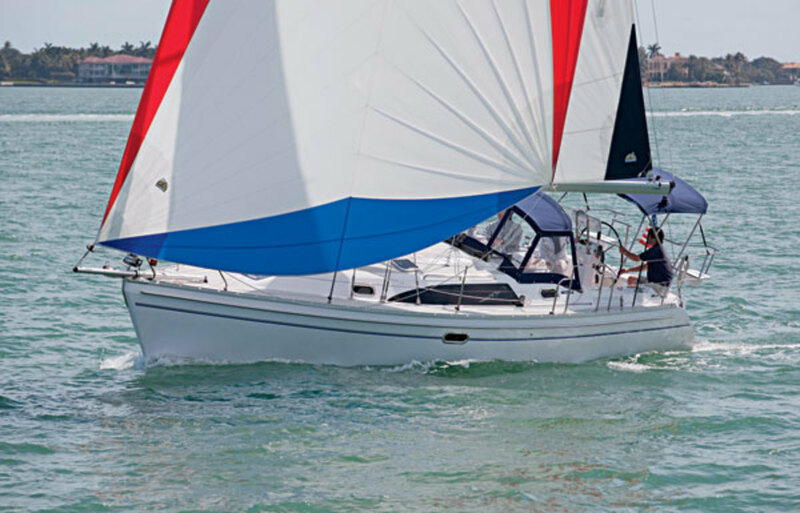 Boats in the 5 series carry slightly less beam, and this shows in the 315’s performance under sail. The day of our boat test we had 12-14 knots of breeze out on Miami’s Biscayne Bay, which proved perfect for putting the boat through its paces. On a beat and close reach, the boat behaved just as it should, accelerating in the puffs and easily passing through irons each time we tacked. What really impressed me, though, was the way the boat lit up when we turned back downwind and unrolled the A-sail, which Douglas had tacked onto the boat’s short Seldén bowsprit. Next thing we knew we were tramping along at 8-plus knots and having the time of our lives.Shortly after we put up the sail, a puff knocked the boat on its ear, which proved too much for the rudder and caused the boat to round up until the chute collapsed. But that was as much the crew’s fault for not paying attention as it was the boat’s, and when the next puff hit, I simply eased out the main to spill some of the excess pressure, and the boat stayed on track, as if riding a rail. After that, the helmsman and I had a blast coordinating our efforts, for all intents and purposes sailing that 31-foot cruiser like a racing dinghy. If the look on Douglas’s face was any indication, I believe he approved. In the flat water of Biscayne Bay, the boat’s 21hp Yanmar scooted us along quite nicely: 2,500 rpm gave us 6 knots, while opening up to 3,000 rpm yielded 7.4 knots. The boat’s stern pulled a bit to port when I first dropped her into reverse, but as soon as I got some way on the 315 behaved just as it should, even when maneuvering at slower speeds in a crosswind. Don’t be fooled by the fact that Catalina has chosen an evolutionary course over the years as opposed to constantly reinventing itself. Boats like the Catalina 315 are every bit as modern as their more sleek-looking counterparts, with a truly outstanding build quality. It’s hard to go wrong with a Catalina.